poppy & gray: holy sh*t! 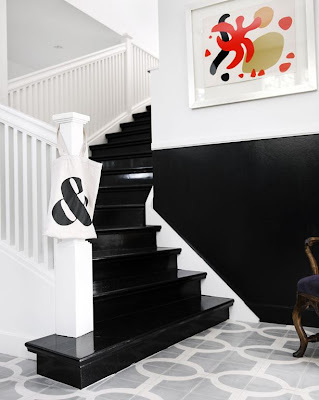 spotted this on cococozy, where the concrete tiles were featured which, i agree, are super cool but look at those black stairs! black and white has never looked so stunning! well, i'm sure it has but not that i've seen for, say, two weeks at least. why are people so afraid to paint wood? i'll give you "original to the house weathered oak" but this looks a billion times better than "installed in 1986 honey oak" ever does.